Straight to the point, a lot of writing which I try and avoid as a lot of people generally give up so maybe shortening it by a couple of lines and increasing the font size would IMO be good but non the less a very good tract that I would buy again. This looks like a MUCH NEEDED message to get out. 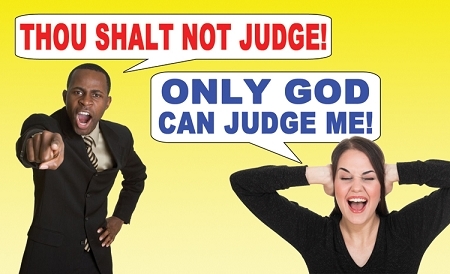 How many times, as a street preacher, have I heard this accusation that I should not judge. People who say that clearly do not understand Scripture. I have even heard pastors say this stuff. Thank you for making this important tract! God bless. Whoa !!! This subject is so right on bc most people who thinks they know their bible often quote this as as a way to excuse their bad behaviours. Also even unbelievers tend to use this verse a lot as if they know what they're talking about. I really like this tract it really rebukes them and put them to shame. Let us pray more & more souls are being drawn to our Wonderful Saviour, JESUS CHRIST. God bless His people . 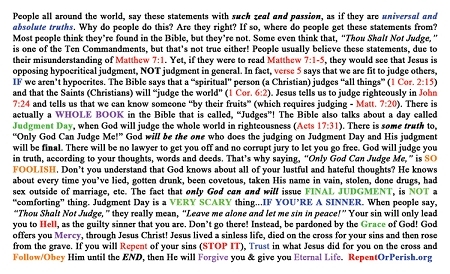 This is a great tract to give out to all those (including professing Christians) who do not think that we are supposed to be judging our brothers and sisters in Christ and the ones that confuse judging other's souls from their fruits in order to share the Gospel. What a great explanation. I also keep this card for a reference. 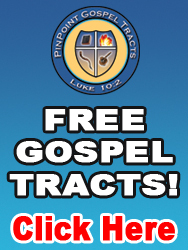 This tract is what we need to fight the poor excuses of the people today!! !